Home Whole Wheat Oatmeal Donuts Whole wheat- Oatmeal Donuts! Hi everyone! 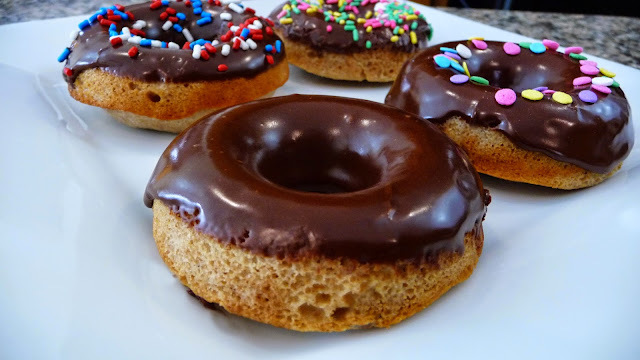 Today’s recipe is a delicious dessert that can be eaten as breakfast as well, and it’s also in the healthier side for desserts, so if you are on a diet, and can’t give up a delicious looking Doughnut, these babies are exactly what you need! Whisk the egg with the milk and vanilla extract, set aside for a minute. In a large bowl, sift the whole wheat flour, oatmeal flour, baking powder, nutmeg, salt and sugar. Add in the coconut oil and yogurt, combine until you get a breadcrumb kind of texture. Pour batter into your donut pan. And bake at 350ºF for about 8-10 minutes or until cooked. Donuts should be light golden brown on spring back when you touched. Let them cool completely before glazing them! For the Glaze I just melted about ⅓ cup of dark chocolate. Then dip the donut right in the chocolate, tap it to remove the excess chocolate. Decorate with color sprinkles or shredded coconut!